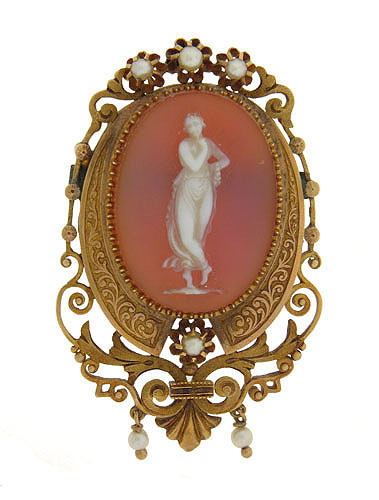 This elegant antique cameo features a full figure stone carved cameo. The Grecian figure is draped in a wispy gown and framed in an intricately engraved 14K yellow gold frame. Three figural flowers set with pearls crown the top of the setting, another pearl set flower decorates the bottom. Swirling acanthus leaves and organic filigree surround the golden frame. This remarkable cameo was featured in Victoria Magazine. 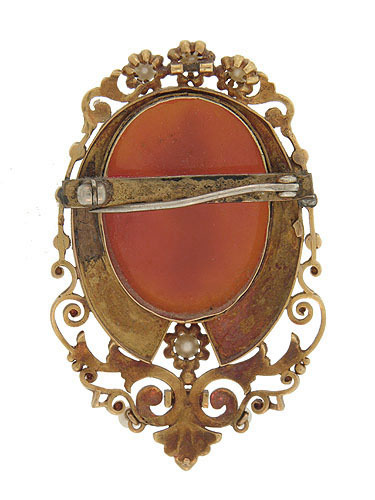 The Victorian cameo measures 1" long, 3/4" in width. The setting measures 2" in length and 1 1/4" wide. Circa: 1870.